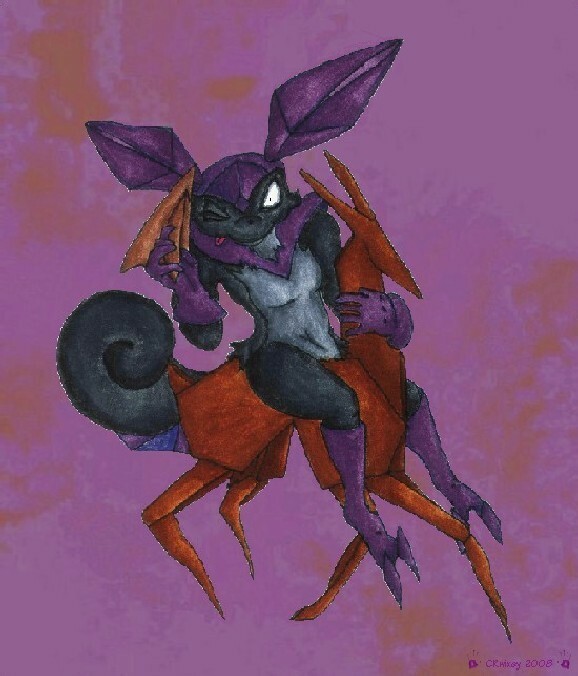 Another evolution of Squirrisu (please see http://www.Fanart-Central.net/pic-718900.html). The name's a combination of squirrel and reiyo, which is Japanese for "antelope". This nutty squirrel’s all about speed. Squireiyo gallops around at full pelt, bombarding anyone unlucky enough to be in the vicinity with pointy paper darts and the occasional paper plane. Unfortunately (for Squireiyo anyway), the antelope's legs crumple with an alarming frequency and fall to bits on making contact with even the smallest of puddles. Squireiyo doesn't mind though, because it can always make another one - though where it gets the origami paper from is anyone's guess. Date Submitted November 4, 2008, 4:10:02 PM Time Taken Around 3 hours. Views 1158 Reference Front cover of the book "Complete Origami". Me: why is all this origami paper in here? You keep Origmai paper in your backpack?? Wow, that's good! That's 4! Can't wait to see the last evolution! Nice job! Number 5 hasn't been drawn yet, it still needs some work. And I'm a bit worried I haven't got enough of the right colour left... we'll see. Aww, never mind. I didn' mean to make you nervous! Protend I never said anything. Hahah. how do you come up with all these pokemon ideas, anyway? I'm sorry, I can't really answer your question. The ideas just sort of... turn up. But erratically, as sometimes I won't get any new ideas for days or weeks at a time, and then suddenly I'll get several at once. ok, thats really all i was asking, a general overview that gives the basic idea. telling me that they just 'turn up' is good enough for me. That's good, I know saying they just "turn up" is a bit vague, but that really is where the ideas come from.